Gorgeous ceramic Christmas tea light holder by Gisela Graham. Ceramic Santa Claus lantern with star cut outs. Glitter Snow Storm. Warm white LED's. Christmas design inside. This battery operated Decoration has the following features Can I have my order faster?. Requires 3 x AA Batteries (NOT INCLUDED). Size: 20cm High x 12.5cm Wide. Vento leggero - Candelieri - Teelichthalter. Struttura in legno a forma di casa, bianca laccato. EAN Nicht zutreffend. Marke Markenlos. non incluso. Oggetti decorativi in qualsiasi foto. Cut out snowflakes design on 4 sides of lantern and on the peaked roof. White wooden LED hanging lantern. Christmas scene with a reindeer Christmas trees and snowflakes. Beautiful red frosted glass lantern. Beautiful lantern would look a treat with a candle inside. CHRISTMAS LANTERN. Whilst every effort is taken to ensure the colour of the product in the photographic image appears as accurate as possible there may be slight differences due to the fact that the photographic image does not always truly reflect the exact colour of the item. Decorated around each side is a Christmas Tree. Treasured Gifts For You. LED Christmas Snow Globe Lantern Water Spinner Santa Claus. Water spinner creates a sparkly glitter effect. When switched on it lights up and the water spinner spins the glitter inside. Features a jovial Santa Claus inside the globe. Christmas Lantern PVC plastic rustic gold colour warm white led Christmas decorations This christmas lantern fitted with warm white LED string light in side. Required 3 AAA batteries (not included) with On/Off switch at the bottom. Light up Star lantern. Wonderful Christmas room or window decoration. Contains 10 LED's. Battery Operated. Can I have my order faster?. Calendars / Diaries. Approx Size: 40cm. Gifts for Kids. A charming wool Christmas mouse with lantern. Christmas Lantern PVC plastic rustic silver colour warm white led Christmas decorations This christmas lantern fitted with warm white LED string light in side. Required 3 AAA batteries (not included) with On/Off switch at the bottom. Position as a table centrepiece or place at your fireside for a lovely warming glow. Battery operated. Requires 2 x AAA batteries (not included). Stand or hang to illuminate your Christmas in style. This christmas lantern fitted with warm white LED string light in side. Required 3 AAA batteries (not included) with On/Off switch at the bottom. Ideal for Christmas gifts, Christmas decorations Table Top Decorations Approx Size; 17cm x 30cm. Approx 13cm High these look great displayed this Christmas. Starlight LED Lantern. Snowman Design. Shaped Cut Out Card Lantern. With Colour Changing LED Lights. Height - 16cm. Can Be Used Free Standing or Wall Hanging. LED Light Up Christmas Lantern with Santa Claus Inside. LED lights when switched on. Hexagonal shape with top carry ring. LED battery powered pillar candle inside. Cut out reindeer, snowflakes and Christmas tree design on 4 sides of lantern. White wooden LED hanging lantern. Snowflake design on roof of lantern. Operated by 3 AAA batteries (not included) with on/off switch Ideal for Christmas gifts, Christmas decorations Table Top Decorations Approx Size 14cm x 30cm. Baby Shower. RC Toy Mix. PARTY DECORATIONS . This christmas lantern fitted with warm white LED string light in side. Required 3 AAA batteries (not included) with On/Off switch at the bottom. Ideal for Christmas gifts, Christmas decorations Table Top Decorations Approx Size17cm x 36cm. 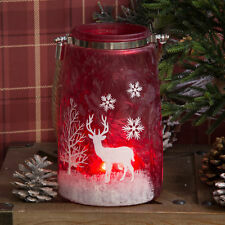 A beautiful frosted snowflake glass jar with a string of LED lights inside. Place in the middle of your dining table as a table centrepiece. Perfect for window sills and ledges. Battery operated. Requires 2 x AAA batteries (not included). Add colour and a warm glow to your Christmas festivities. It features a jolly Santa, festive foliage and a scattering of snow, which all adds up to a traditional Christmas. Requires 3 x AAA batteries (not included). Jack Frost has been nipping! Wonderful frosted glass candle lantern. The frosted white glass has a crispness to it that combines beautifully with the white snowflake design. The glitter details give the lantern a pretty glint, as if snow has started falling. Baby Shower. This christmas lantern fitted with warm white LED string light in side. Required 3 AAA batteries (not included) with On/Off switch at the bottom. Ideal for Christmas gifts, Christmas decorations Table Top Decorations Approx Size 14cm x 26cm. Featuring Santa scene with sparkling glitters that move inside the lantern. A beautiful Santa Scene Lantern. Made from durable plastic. Operated by 3 AAA batteries (not included) with on/off switch Ideal for Christmas gifts, Christmas decorations Table Top Decorations Approx Size 14cm x 30cm. Baby Shower. PARTY DECORATIONS . Wall & Window Decorations. Shatchi Festive Quality Christmas nativity old style lantern with led lights and snowman inside. Add colour and a warm glow to your Christmas festivities. It features a jolly snowman, festive foliage and a scattering of snow, which all adds up to a traditional Christmas. Requires 3 x AAA batteries (not included). North Star Collection colour changing ceramic Santa lantern. Colour Changing LED Santa Lantern. Cut out stars in the front to show the colour changing light from the LEDs inside. All orders dispatched quickly. Simply personalised. The lantern requires x3 AAA batteries. The lantern can be switched on/off from a switch on the base. Height: 27 CM. Width: 10.5 CM. Depth: 10.5 CM. 18 LED STORM LANTERN. This is an ideal Christmas Light or for those places to give a warm glow to. Colour Red. Warm Ambient Light. Happy for collection from Rainham, Essex. Starlight LED Lantern. Candy Cane Design. Shaped Cut Out Card Lantern. With Colour Changing LED Lights. Height - 16cm. Can Be Used Free Standing or Wall Hanging. Holds one tea light to give a lovely glow (candle not included). Height 20cm (not including hanging handle). Shatchi Festive Quality Christmas nativity lantern with led lights. Set of 8 assorted design Christmas tea light holders. 4.5” tall without handle. In Ivory with a hint of gold shabby chic style. Assorted designs of Christmas trees, hearts, reindeer. Lovely as place settings on a table or as other decorations around the home.